An image published on Monday showed what is claimed to be a number of non-approved Lightning authentication chips, suggesting that unauthorized third-party accessories may hit store shelves before Apple's own partners are able to produce their own products. With Lightning cables and adapters already in short supply from Apple, currently the only producer of said accessories, many unlicensed third-party manufacturers have been looking to take advantage of the situation, though the connector's security chip proved to be an effective deterrent against such production. Apple's security measures may have been cracked, however, as Apple.pro (via BGR) posted an image of what it claims to be "third party non-approved authentication chips" for Lightning cables. According to the source of the photo, there are currently "multiple versions" of the unauthorized chip being produced in China, possibly pointing to the imminent release of inexpensive accessories. 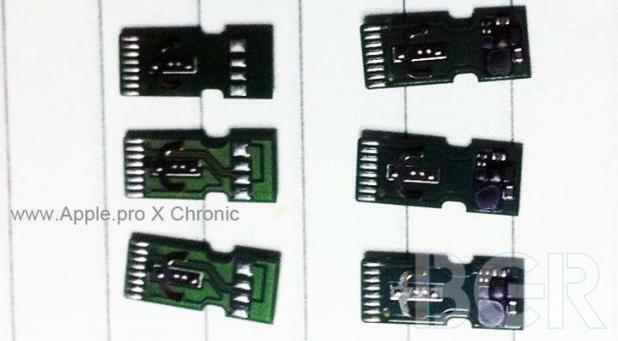 AppleInsider was first to report that Apple was presumedly using authentication chips in its new 30-pin dock connector replacement, with the discovery seemingly confirmed by a teardown of the Lightning port by Chipworks. In the investigation, the analysis firm found that the embedded authentication chip uses security technology seen in printer cartridges, which was declared to offer "just enough" security for the time being. A report in early October suggested that Apple's chip had been reverse engineered, though the rumor failed to yield any products.